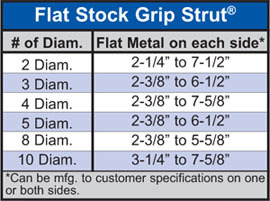 Flat Stock Grip Strut® is available by special order in all standard materials and sizes listed throughout this catalog. Please reference table for approximate dimensions of flat metal available on each side. The open matrix is symmetrical across the flat plane. Flat stock can also be manufactured to customer specified flat metal dimensions on one or both sides.